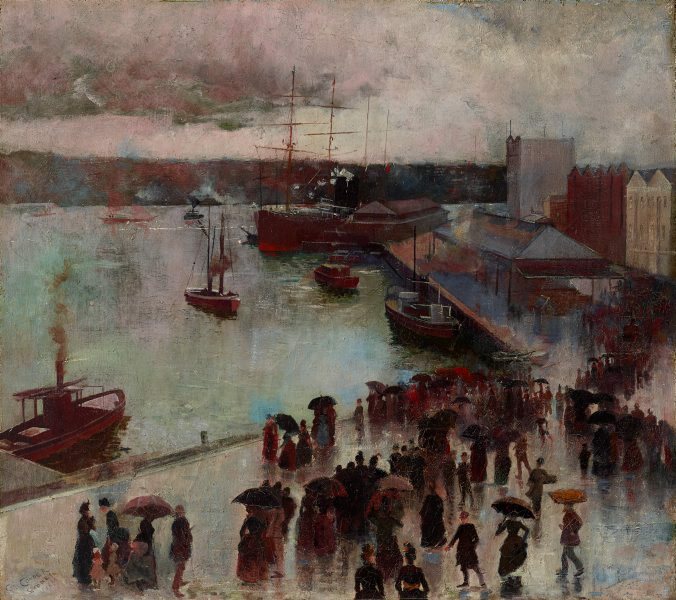 Arriving in Australia as an adolescent in 1884, Charles Conder became one of the key founders of the Heidelberg school of Australian impressionism. He returned to Europe six years later to become a legendary figure of the fin de siècle, mixing with leading artists and writers including Henri de Toulouse-Lautrec and Oscar Wilde. Exhibited in Sydney in 1888, 'Departure of the Orient – Circular Quay' was Conder’s impressive artistic debut. 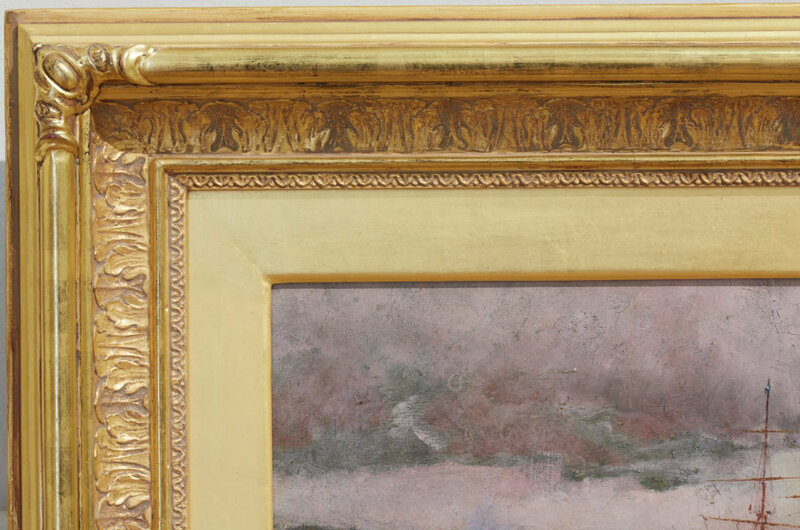 With its silvery-grey tonality, contrasted with touches of brilliant colour, the work reflects the influence of Whistler and the principles of Aesthetic painting. Conder’s interest in Japanese art – or Whistler-inspired Japonisme – with its large, empty spaces, is also paramount. Signed and dated l.l. corner, incised "CHAS CONDER/ SYDNEY/ 1888". Signed and dated l.l. corner, red oil "CHAS CONDER/ SYDNEY/ 1888". Leigh Astbury, Meridian , 'Poetic impulses in Australian landscape painting: the Heidelberg school reconsidered', pg. 123 - 141., Bundoora, Oct 1985, 129. Bonny Cassidy., Tertangala , 'Charles Conder: a retrospective 1868-1909', Wollongong, Aug 2003, (illus.). Exhibition review. Peter Entwisle, Nerli - An exhibition of paintings & drawings , 'G.P. Nerli: Influences in Australia', pg. 28-38, Dunedin, 1988, 21 (illus. ), 28, 32, 34, 36. Brian Finemore, Painting , 'Introduction', pg. 4-5, London, 1961, 4, 13 (illus.). This work is titled "Departure of the S.S. Orient". Ann Galbally, Craft arts international , 'Charles Conder 1868-1909', pg. 81-83, Sydney, 2003, 83 (colour illus.). Sasha Grishin., The Canberra times , 'Spirit of brilliance', Ainslie, 22 Jun 2003. Exhibition review. Kerry Heckenberg, Queensland Review (vol.15, no.1) , 'JJ. Hilder and the Languages of Art', pg. 33-49, Queensland, 2008, 35. Martin Hopkinson, The British art journal [vol. V, no. 2] , 'Charles Conder 1868-1909 by Ann Galbally and Barry Pearce', pg. 98-99, London, 2004, 98. NOTE: Book review. Patrick McCaughey, Encounters with Australian modern art , 'Affinity and antinomy in Australian painting 1960-1985', pg. 79-178, South Yarra, 2008, 89. Denise Mimmocchi, Australian Symbolism: the art of dreams , ‘Dreams of the bohemian idyll: Charles Conder and his impact’, pg. 90-110, Sydney, 2012, 90-91. Les Moseley, Look , 'From the Society president', pg. 9, Sydney, Aug 2015, 9. Barry Pearce, The Weekend Australian , 'Forgotten impressionist', pg. 16-17, Sydney, 07 Jun 2003-08 Jun 2003, 17 (colour illus.). Barry Pearce., Australian artist , 'Charles Conder: lost and found voice of the Heidelberg School', Chatswood, Jun 2003, (colour illus.). Jill Stowell., The Newcastle herald , 'Flamboyant architect out of the shadows: Imbalance redressed on distinguished career', Newcastle, 02 Aug 2003. Arthur Streeton, Argus , 'Eaglemont in the 'Eighties: beginnings of art in Australia', pg. 49, Melbourne, 16 Oct 1934, 49. 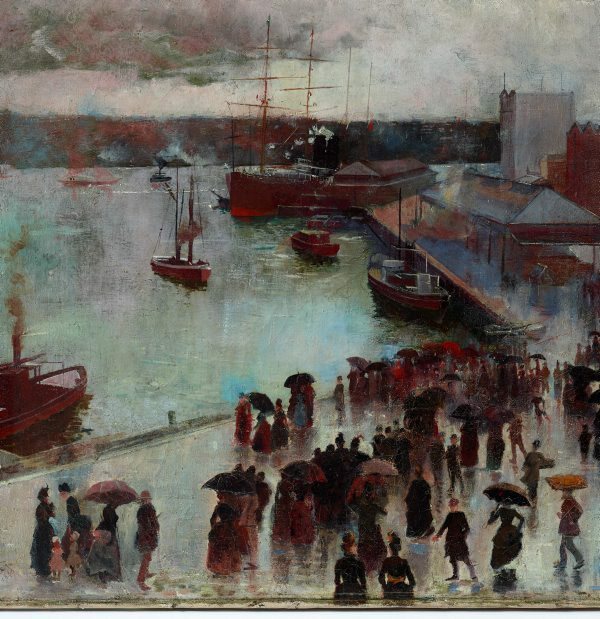 Martin Terry, Art Monthly Australia , 'Moulin Rouge: Charles Conder at the Art Gallery of New South Wales', pg. 31-34, Canberra, Nov 2003, 31-32. Daniel Thomas, Art Gallery of New South Wales Quarterly , 'The Art Gallery of New South Wales', pg. 10-15, Sydney, Jan 1960, 14. Elizabeth Young, Australian painting: colonial, impressionist, contemporary , 'Impressionist', pg.11-17, Adelaide, 1962, 16, 39, 55 (colour illus.). cat.no. 33. Art of Australia 1788-1941 , New York, 1941, 35. cat.no. 46; titled 'Departure of S.S. Orient'. The story of Australian art from the earliest known art of the continent to the art of today (Vol. 1) , Sydney, 1934, opposite 91 (illus.). The Tatler: art, literature, music and the drama illustrated , Melbourne, 05 Jun 1898, 24. Exhibition of Australian art in London , London, 1898, 49. cat.no. 311; titled 'Departure of the "Orient"'; lent by the Trustees of Sydney Gallery; NOTE: Artist is 'Chas. Conder'. Table talk , Melbourne, 05 Oct 1888, 4. The Sydney Morning Herald , 'The pictures', pg. 5, Sydney, 18 Sep 1888, 5. NOTE: Review of Art Society of New South Wales Ninth Annual Exhibition. Illustrated Sydney news , 'Leading pictures at the Art Society's exhibition', pg. 7, Sydney, 17 Sep 1888, 7 (illus.). Hand-drawn illustration of 'Departure of the Orient - Circular Quay'. Art Society of New South Wales Ninth Annual Exhibition Catalogue , Sydney, Sep 1888, 34. cat.no. 140; titled 'Departure of the Orient - Circular Quay'; priced £21; NOTE: Artist is 'Chas. Conder'. Charles Conder - his Australian years , Melbourne, 1960, 7, 12-13, 17-18, 20, 25, 31 (colour illus.). plate no. 6; cat.no. 10; titled 'Departure of the Steamship Orient' on pg. 25; titled 'Departure of the S.S. Orient' on pg. 31. Making art connections: Visual arts years 7 & 8 , 'Lets make an artwork: Peeking into private worlds', pg. 38-39, North Ryde, 2010, 38 (colour illus.). Sotheby's Melbourne: Important Australian Art, 25 & 26 August 2008 , Australia, 2008, 41. NOTE: Artwork reference in relation to painting "The Fatal Colours" which was for sale. Art Gallery of New South Wales: highlights from the collection , Sydney, 2008, 58 (colour illus. ), 59. Art of Australia. Vol 1: Exploration to Federation , 'Our hill of gold', pg. 419-484, Sydney, 2008, 443, 444 (colour illus. ), 576. Exiles and emigrants: epic journies to Australia in the Victorian era , Melbourne, 2005, 99 (colour illus. ), 137. Conder & friends , 'The painting of modern life', Melbourne, 2003, (colour illus. ), (colour illus., detail). Peintres Australiens à Etaples , 'Les Picardistes', pg. 14-26, Étaples-sur-Mer, 2000, 15, 16 (colour illus.). John-Peter Russell, un impressionniste australien : dans les collections françaises, autour du dépôt au Musée de Morlaix du legs Jouve, Musée du Louvre - fonds Orsay , Morlaix, 1997, 15. Two hundred years of Australian painting: nature, people and art in the southern continent , Tokyo, 1992, 94 (colour illus.). cat.no. 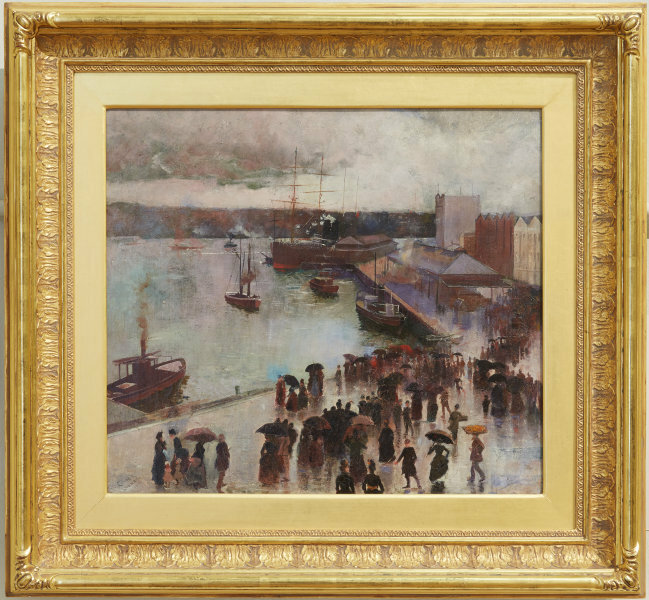 49; titled 'Departure of the Orient - Circular Quay'; NOTE: See also unpublished translation of catalogue for entry. Girolamo Pieri Nerli (1863-1926) , Melbourne, 1976, 19, 24, 26, 27, 29, 33, (illus.). A study of Australian art , Sydney, 1949, 2 (colour illus. ), 53.